New York Life Insurance Company today announced a partnership with STATS, the company that tracks a myriad of major sports statistics, to launch the "New York Life Protection Index" which will show how well an offensive line protects its quarterback. STATS says this is the first team ranking index to incorporate STATS' proprietary data including quarterback knockdowns and hurries as it focuses solely on each team's offensive line. 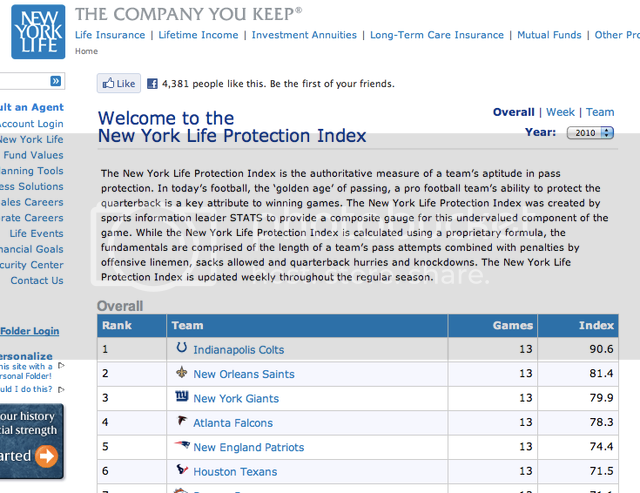 The index, updated weekly throughout the regular season on Tuesdays, will be available on New York Life's website at www.newyorklife.com/protectionindex. "New York Life is pleased to partner with STATS to create this innovative index that demonstrates the importance of being protected on the football field and bring more attention to the often unsung heroes that battle in the trenches -- the offensive line," said Mark W. Pfaff, executive vice president, New York Life. 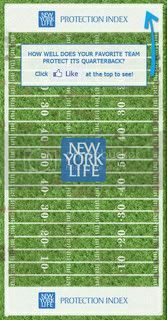 "Just as an offensive line is designed to protect its quarterback's blind side, New York Life offers life insurance products that protect individuals, families and businesses from unforeseen circumstances." The New York Life Protection Index is comprised of two basic elements -- the percentage of times a team successfully protects its quarterback and how often and effectively the team passes the football. After these statistics are inputted into the proprietary algorithm, a numerical index is assigned to each team. "STATS is proud to team with the football enthusiasts at New York Life to introduce this intriguing new statistic," said STATS Senior Vice President of Sales, Greg Kirkorsky. "STATS has a long-held mission to revolutionize the way sports are viewed, understood and enjoyed -- and the New York Life Protection Index accomplishes just that. The New York Life Protection Index not only gauges each team's ability to protect the quarterback, but it has proven that pass blocking is a key attribute to winning games and making a championship run." Through Week 14, Indianapolis (90.6) and New Orleans (81.4) lead the team standings. The Chicago Bears are currently last.